As most people can guess, water and electronics are not usually good combinations as water will corrode or short out important circuits on an electronic device. Recently, with companies like Samsung introducing water-resistant and water-"proof" phones, we can see a new generation of people not freaking out when a little bit of water gets splashed unto their phones. However, alot of people still make the mistake of assuming that these smartphones can survive a swim in the pool - which is not the capability of most smartphones with rated with the IP standard (dust and water resistant rating). Almost all phones today rated with the IP standard are completely dust resistant though so you can rest easy knowing that dust bunnies won't kill your smartphone. As it stands, there are no currently no iPhones that are even advertised as even waterproof. As a matter of fact, even the Android phones that market themselves as being waterproof cannot handle being submerged in a pool of water for longer than 30 minutes - never take liberties with phones that are "waterpoof". Having said that, the newer Samsung Galaxy devices do have better water resistance than the newer iPhones - they are more likely to survive in the shower with you (not that we'd endorse such actions) - but still aren't waterproof. Every single iPhone with any kind of water resistance (iPhone 7 and higher) should be able to withstand the occasional splash in the water but do not subject it to long term exposure to water. If you have any other iPhones, keep it out of any possible water contact - by itself they are not water resistant in any way. Even water "proof" phones are hardly waterproof - they are not meant to swim with you in the ocean. Top Android phones may have superior water-resistance than flagship iPhones, but still can't be taken to the ocean with you by itself. Any other phones, keep then out of water at all costs. Thankfully, here at HiTech Handymen, we can help certain water-touched phones restore their functionality - phones that have had minimal exposure to water can be restored to original working conditions. 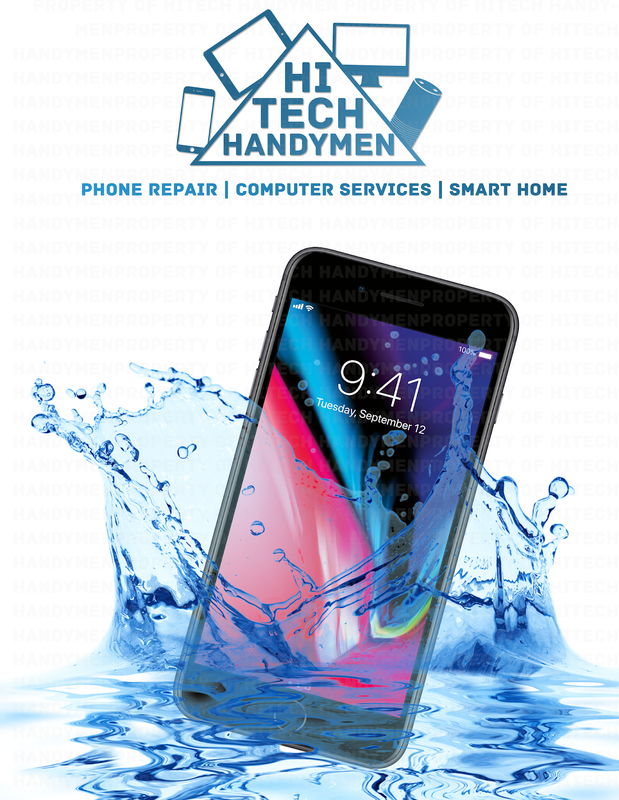 While we can help fix water-damaged phones, we unfortunately cannot offer any warranty on it - because you never know whether the corrosion from water contact will cause problems down the line. If so, it's impossible to monitor when such corrosion and recurring damage may occur. But we can help fix water-damaged phones!